Catalan leader Carles Puigdemont has not given a clear answer on whether he has declared independence for the Spanish region. The Catalan government has tweeted an English version of Puigdemont’s letter to Spanish prime minister Mariano Rajoy. Puigdemont offers to meet him as soon as possible to discuss the controversy, but fails to give a yes or no response on independence. He calls for an end to the “repression” of the Catalan people and their government, citing charges against Catalan demonstrators and the chief of the Catalan police. He also calls for a meeeting with Rajoy “as soon as possible” to find a solution. Madrid has responded, the Spanish premier “deeply” regretting Puigdemont’s failure to clarify his stance. Spain’s central government had set a deadline of 10am on Monday for Puigdemont to give a “yes” or “no” answer – and until Thursday to change his mind should the reply be affirmative. Madrid has threatened to suspend Catalonia’s autonomy under Article 155 of the Spanish constitution, if independence is declared. 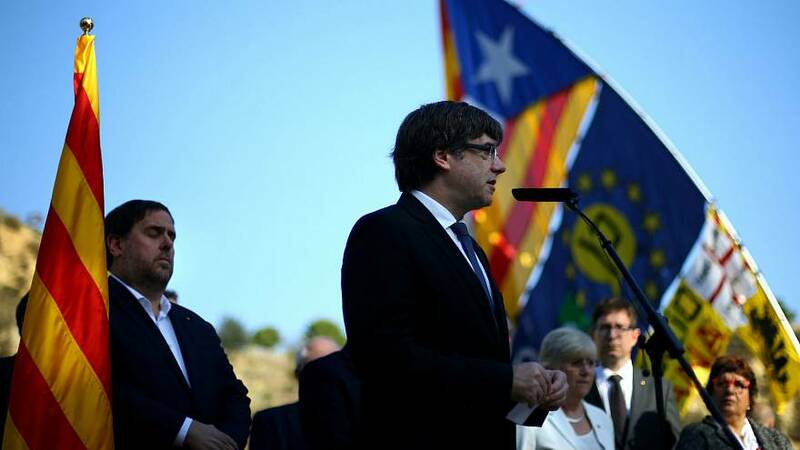 In addition to the letter, Carles Puigdemont is said to have included documents including a copy of the breakaway Referendum Law that his minority government rammed through the regional parliament with help from its far-left ally CUP. The move bypassed ordinary parliamentary procedure, prompting an opposition walkout. Puigdemont, the leader of the “Together for Yes” coalition, declared independence for Catalonia last week after the region’s disputed and controversial referendum. The vote, declared illegal under the constitution by Spain’s constitutional court, was marred by violence among Spanish police sent to stop it. But the Catalan leader immediately suspended the independence declaration to allow for talks with Madrid, sparking confusion and the setting of today’s deadline for clarification. Rajoy’s new letter to Puigdemont now seeks a yes or no answer by Thursday at 10am, warning that he will be the “only person responsible for applying” Article 155. “We believe that Mr Puigdemont has an opportunity to change course,” Spain’s Deputy Prime Minister Soraya Saenz de Santamaria told a news conference on Monday morning. “Puigdemont has the opportunity to say that he doesn’t have to revoke (independence) because he didn’t declare it”. She refused to lay out concrete dates for possible application of Article 155, which would see autonomy in Catalonia suspended.